Kylee is the daughter of Gilbert Arismendez and Karli Oliver. Kylee is a pre-kindergartener at Faulk Early Childhood. In her spare time, Kylee enjoys playing with her toys, her dolls, and her dogs Camila and Mercury. Her favorite color is pink. She likes school because she likes to learn about letters and to eat lunch. Kylee would like to work at Walmart when she grows up. Kylee Arismendez was selected as “Panther of the Month” because she is a dedicated student. She follows schools rules and makes good choices. Kylee is a good helper to her teacher and her classmates and a great friend to everyone. 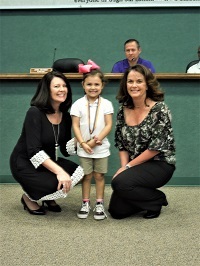 Faulk Early Childhood is proud to have Kylee Arismendez as their Panther of the Month. Cody is a 3rd grader at Kieberger Elementary and is the son of Gordon Clark. In his spare time, Cody enjoys playing on the computer and helping his dad. Cody’s favorite subject in school is math and he enjoys dancing to the math songs that are played in class. Cody was selected as "Panther of the Month" because he is always a good friend to others! Cody follows class rules and directions, uses his manners and is becoming more social and outgoing. Most outstanding is he is always HAPPY!! Kieberger Elementary is proud to have Cody Pollard as their Panther of the Month. Adrian is the son of Marissa Allegria and stepson of Lamar Delbosque, and the grandson of Elizabeth Rosales. Adrian has two younger sisters and several step brothers. Adrian has two dogs and his favorite color is blue. His favorite hobby is playing video games. His favorite subject in school is math. He likes school because he can learn new things everyday while spending time with his good friends. When he grows up, Adrian hopes to become a police officer. Adrian was selected as Panther of the Month because he is always smiling and very polite. He is very respectful and always puts others first. We are very proud of his hard work and dedication. Please join us in congratulating Adrian De La Paz. He is one of the many bright stars we have at Charlie Marshall Elementary. Lluvia is a 6th grade student at A. C. Blunt Middle School. She is the daughter of Rosa Boites. Lluvia is the only girl in her family and has two older brothers and one younger brother. Lluvia’s favorite class in school is art. In her spare time, Lluvia likes to show off her creativity by painting. She also likes to play video games. When she finishes school, she wants a job that involves helping animals and might like to become a veterinarian. Something that might surprise others about Lluvia is that she likes to bake and makes the best chocolate cake ever. Lluvia Fuentes-Boites was selected as “Panther of the Month” because she is a dedicated student. She was nominated by her teachers because she always follows the rules, makes good choices, and is a good example for fellow classmates. A.C. Blunt Middle School is proud to have Lluvia Fuentes-Boites as their Panther of the Month. Blake is a junior at Aransas Pass High School and is the grandson of Sandra Walch. In his spare time, Blake enjoys working out, developing and watching YouTube videos, and playing games. He also enjoys taking care of his pet cat, Amelia. Blake’s favorite subject in school is math and his goal is to become a YouTuber or a game developer when graduates. Blake was selected Panther of the month at Aransas Pass High School because of the hard work and dedication he exhibits. He is always polite and displays good citizenship. Aransas Pass High School is proud to have Blake Pate as their Panther of the Month.